We have never wanted a Banana Split more than when we watched the Minion movie. Strawberry, vanilla, and chocolate ice-cream in a banana boat. Whipped cream topping with a cherry on top. Oh yeah, doesn’t that sound so good? If you were a Minion you could live off of whatever banana related food you wanted. Or you can lounge around with your other Minion brethren doing whatever it is Minions do. Oh right, it’s being awesome. No matter what Minions do they are being awesome. Playing table tennis? Awesome. Watching the latest episode of the Walking Dead on the Jumbo Tron they borrowed from New York City? Super awesome. Now you can be as cool as these dudes. 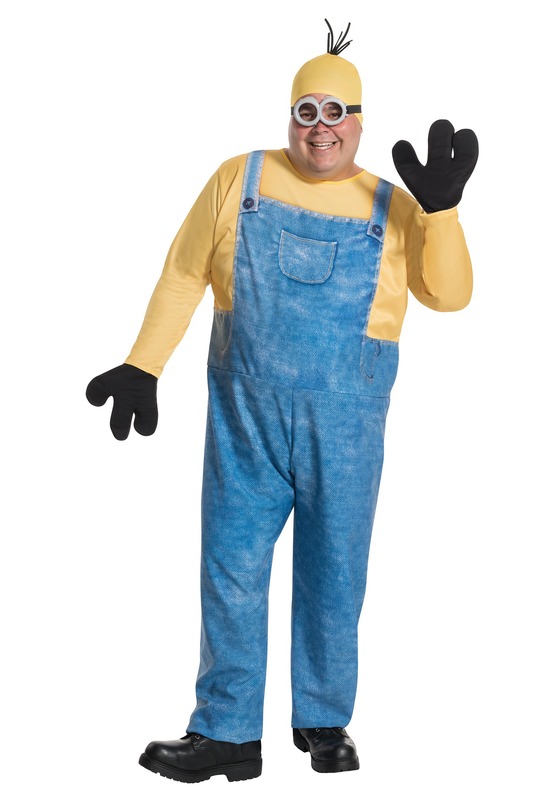 Just slip on this Plus Size Minion Kevin costume, and grab a banana split. You’ll be the coolest dude to walk down the street in overalls. And let’s face it, the most awesome person in your neighborhood. You’ll get to have adventures like the Minions, well, maybe not JUST like the Minions. You’d probably get in trouble if try to steal the Statue of Liberty, even if it is the small one from Las Vegas. But, just think of all the Banana Splits you could have. Just, for the love all that is awesome, do not build a fart gun. Stick to stuff a little less smelly.